WASHINGTON – As conversations continue about the benefits and challenges surrounding free college programs throughout the nation, institutions, states and the federal government have an opportunity to improve college affordability and move towards equitable free college programs, according to education policy experts and college completion leaders featured on “The State of Free College” panel hosted by the Institute for Higher Education Policy (IHEP). Featured speakers on “The State of Free College” panel. Expanding on IHEP’s analyses of the Tennessee Promise program and New York’s Excelsior Scholarship – two programs that researchers found to “fall short” on making college affordable for low-income students – panelists discussed elements of several free college programs that proved sustainable, efforts to increase the distribution of aid to low-income students first and opportunities for partnerships and federal support for institutions to serve their students well. Among the concerns about free college programs is that such efforts do not cover non-tuition related expenses such as housing, transportation or outside educational fees. “The devil is in the details,” said Jen Mishory, a senior fellow at The Century Foundation. Mishory’s research on free college programs found that early programs in the 1990s were “first-dollar” models and income-targeted, with some tying their eligibility to free and reduced lunch status. These programs, such as the ones in Indiana, Oklahoma and Washington state, also extended to both two- and four-year institutions, another equitable recommendation that both IHEP and The Education Trust have promoted in their reports on improving free college programs. “We have a highly stratified higher education system already,” said Mamie Voight, vice president of policy research at IHEP. Having free college programs that focus primarily on two-year colleges reinforces the stratification of low-income and other underserved students to community colleges when they should have the opportunity to attend any institution type that benefits them, Voight added. Despite their shortcomings, the successes of free college programs, particularly in Tennessee, include an increase in the college-going culture and a renewed value in transfer agreements, said Dr. Kenyatta Lovett, executive director of Complete Tennessee. When Tennessee first established its Promise program in 2015, there were nearly 60,000 applications, Lovett said. Public-private partnerships with community organizations and others have also united K-12 pathways and helped to get people excited about college. Now, due to informed state leadership decisions, analysis of local evidence and increased financial resources, momentum is building around the state’s “Drive to 55” initiative to equip 55 percent of Tennesseans with a college degree by 2025. Lovett said the challenge going forward will be building the state’s community college system’s capacity to retain, support and serve the diverse cohort of students enrolling. He asked if the community colleges – some with substandard graduation rates – are ready to step up and deliver on successful completion outcomes for students. Sustaining financial resources for the free college programs is an additional concern. “Most philanthropy around higher-ed is around scholarships,” Lovett said, adding that donors are starting to believe that leaders have “solved” the problem of college affordability with free college programs. But Promise and other free college programs are platforms, not solutions, Lovett argued. “We need more money,” he said. Sharing and comparing data will also be crucial in improving free college programs. 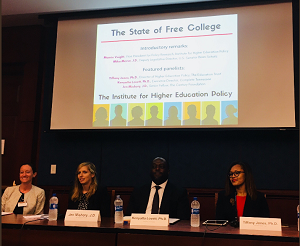 The panelists noted that there are “very real tensions” impacting policymakers political and financial support of equitable free college programs. They range from misconceptions about Pell and aid coverage to concerns about who should benefit from the programs. Dr. Tiffany Jones, director of higher education policy at The Education Trust, said that policymakers must not assume that Pell Grants and other state or institutional aid covers all of a student’s cost of attendance. Pell only covers about one-third of college costs, she said, adding that a report from The Hechinger Report found that nearly one-third of students who are eligible for financial aid never receive it. Jones also encouraged policymakers and state leaders to continue equity conversations and reform efforts on financial aid systems and FASFA to identify the students with the most financial challenges. Regarding middle-income students, panelists pointed to free college program models that gradually increase their income-cap to make an impact on college affordability for all. Mishory said that federal policymakers should take into account states’ overall budgetary challenges, pay attention to students’ unmet need and non-tuition costs, focus on having clear affordability targets and fund institutional capacity to serve students well. An equity-minded framework to federal support, Jones added, could be incentivizing states to fund all students equitably, while states can target free college program funding towards institutions that are innovative in serving their students, such as minority serving institutions like Hispanic-serving institutions and historically Black colleges and universities. Lovett, answering an audience question on cost containment of higher education, encouraged institutions to be open-minded about business principles as it relates to the return of investment in supporting and retaining students. “We have to really rethink what higher education means in America,” he said.